Many people often ask, what is it like to sponsor an orphan in India? 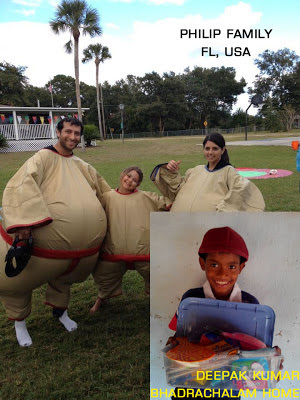 To answer this question, and many of the other questions frequently asked about orphan sponsorship, we will highlight a sponsor each month to share their experience with orphan sponsorship through Big Family Mission (the U.S based organization which facilitates orphan sponsorship with New Hope Children’s Home in South India). This month, we are highlighting the Philip Family, sponsoring Deepak Kumar from the Bhadrachalam Home! How long have you been a sponsor? We became sponsors earlier this year on April, 29th . How did you first learn about the orphans at New Hope Children’s Home? Mrs. Philip began searching for a reputable, Christian based orphanage in South India and found Big Family Mission about six months ago. She first subscribed to their monthly newsletter and later found them on Facebook. With so many orphanages in India what made you choose New Hope Children's Home? We knew we wanted to find an orphanage that would allow us to create a long lasting relationship with our sponsored child. After several months of receiving Big Family Mission’s newsletter and keeping up with them on Facebook it was clear that we would be able to get to know our sponsored child and develop a relationship with him. We also have family friends living in Karnataka, India and asked them if they had heard of New Hope Children’s Home. They had, and spoke highly of Pastor George who founded New Hope Children’s Home. What did you expect from your sponsorship? We didn’t really have any expectations. We were hoping to be able to keep in touch with our sponsored child and learn more about his likes, needs and ways to support him. How did you choose your sponsored child? We knew we wanted an older child as they tend to have a more difficult time receiving sponsors. We also wanted to support a child from the Bhadrachalam home as we noticed the majority of these children were without sponsors. Once we began looking through the online albums we came across a photo of Deepak. He had a sweetness to him and in a strange way we felt a connection with him. We confirmed he was still without a sponsor and immediately signed up sponsor him. How frequently do you hear from your sponsored child? It has only been a few months since we have become sponsors and we can truly say we are thrilled with the level of communication we have received. Within the first month we received a hand written letter and photograph from Deepak. We have had several phone conversations and exchanged many emails with Pastor George, we have sent care packages to India and even received photos and videos of the children receiving the items we sent. As you can imagine Pastor George is very busy, but always makes time to speak with us when we contact him. What would you tell others who are thinking about child sponsorship through Big Family Mission? This organization is unique in that you can call Pastor George directly and speak to him as frequently as you’d like. He will personally tell you how your child is doing and is very accommodating for requests of extra photos or videos of your sponsored child (though it may take him a few weeks to get them to you). Since we have come to know Pastor George we have witnessed him sell family jewelry and even attempt to sell his personal car in order to meet the basic needs of all the children. If you do decide to sponsor with Big Family Mission, you can rest assured that 100% of your donations will be used by Pastor George to ensure the orphans in his care receive a good education, nourishing meals, clean clothing and proper shelter in a loving environment. Thank you Philip family for sharing your experience! To meet children waiting for sponsors, click here: Meet Children at the Four New Hope Orphanages.